About Transition Town Milton Keynes (TTMK) – TTMK is about bringing individuals together to see what we can do to make our local community happier, healthier, more resilient and more gentle on the earth. This local action is about us stepping up to address the big challenges we face by starting local and working together to crowd-source solutions that are built on our network of support and a more caring culture. 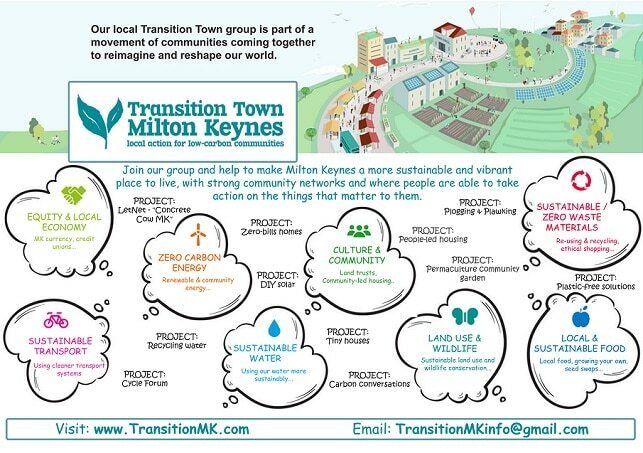 Transition Town Milton Keynes (TTMK) is a community-led volunteer group that exists to strengthen the local economy, reduce our environmental impact and build a more resilient, low-carbon, future. Our group is part of the global Transition ‘grassroots’ movement that has been growing since 2005 and that is happening in thousands of groups: in towns, villages, cities, Universities and schools in over 50 countries around the world. We work together on a wide range of projects that include ways of: increasing low impact affordable housing, sharing skills, creating livelihoods, reducing energy costs and carbon emissions, growing our local food economy and working in partnership with other local projects and organisations. The Transition movement is made up of people like you who are already feeling the benefit of connecting with others to take care of themselves, their community and the planet. Join our group to find out more and get involved in making a difference for our future. A great start is to come along to Transition Town MK’s monthly planning meeting on the first Wednesday of every month. The group meets at ‘The Place to Eat’ cafe, 2nd floor in John Lewis, Central Milton Keynes at 6pm for an hour. You’ll see the group sitting in an area of the cafe close to the lifts – easy to spot for you to come over and say hello. TTMK is a catalyst to all manner of new projects, enterprises and opportunities in MK so there are always lots of things going on to talk about – not least the film nights and events we work on every month. New ideas and new friends are always welcome.